I’ll be honest: barely a week after my northeastern tour ended, I wasn’t very eager to get out onto the street to play music again. But a couple of things got me out there once again. First, a far-flung friend was visiting Portland, and this would be his first chance to see me playing as a one man band. (He’s more accustomed to seeing me in a three-piece band.) And second, the reality of playing outdoors in Portland is, summer doesn’t last forever, so we have to take advantage of the late sundowns and dry sidewalks while we may. And so I picked a spot that has been hit or miss, but more hit than miss, and set about playing. After about 10 minutes I was hitting my stride, and my old friend showed up. I was happy to show him a few old favorites with a new one-man-band arrangement, as well as playing some newer songs he’d never heard before. Soon I was sufficiently worn out, and the audience was the same. The sun called it a day, and so did I. My old friend and I walked to a nearby beer house and downed a couple while catching up on each other. In spite of my initial reservations, I was glad I went out. And before long, I’ll be out there again. Probably! This entry was posted in Shows on August 28, 2015 by a one man band. The last show of the tour! I found myself roadie-less for the afternoon, so I had to drag all the stuff to the show on my own. And on top of a week of one or two shows per day, in heat approaching 100°F (38°C) on each of those days–including today–I was pretty tired before I played the first note. But there’s adrenalin, and final show energy, and just being in New York, so I felt energized in spite of everything. The show started off with a couple of setbacks. First, this was not an official show, so when I got to the building I was supposed to play near, I discovered the field had been taken over by a mass-yoga event. A string quartet accompanied a yogi with a megaphone, who presided over a field’s worth of mats and posers. They weren’t going anywhere any time soon. The obvious thing was to play on the other side of the building, but a crew of rough-looking skateboarders was already there. Undeterred by failing to land tricks over and over (a resilience I’ve observed in most skateboarders) they showed no sign of leaving. Time for Plan C.
The one stroke of luck was that there was no baseball game happening on the field across the path. By now some people had started arriving, and I informed them of my plan to take it to center field. I headed out, set up, and played a little warmup, which drew the people over to sit in a semi-circle around me. So I started up for real. I played for maybe a dozen old friends and a dozen more new ones. Some were fans of my old band Onion Flavored Rings, curious to see what I’m up to now; some were just intrigued by this crazy project of mine; at least one was just a random passer-by. It was reminiscent of the Worcester house show, in that I was listened to, rather than being incidental street noise, and there’s a huge difference between playing for an attentive audience and fading into (or contributing to) the din of city life. I played 10 of the songs from my set list, but opened up the penultimate slot for a request. It’s nice when your audience knows your material enough to make a request. It’s even better when you’re still able to play the song! Then I closed with my usual closer (“Used to It”, an old crowd favorite) and hung around with pals old and new until dark, after which we repaired to a friend’s apartment for some more hanging out. It was a nice peaceful end to a sprawling, hectic tour. The next day I was on a plane back to Portland, looking forward to a little break from daily one-man-banding. Special thanks to Erick Lyle for setting up and promoting the show in McCarren Park, not to mention lodging while we stayed in Brooklyn. And most special thanks to Erin Yanke, the aforementioned roadie for the whole of this tour. This entry was posted in Shows, Tour on August 18, 2015 by a one man band. After a long day of driving from Portsmouth, NH, (where I played barely 10 hours ago) and dropping our friend off at a train stop in Massachusetts so he could fly home via Boston’s Logan International, my roadie and I were pretty tired. But this was my only chance to play in the subway. I’ve been impressed by many subway musicians in New York City over the years, and it felt almost presumptuous that I could take my place among them, even way past rush hour. But if you can make it here, etc. I’m not sure what “making it” would entail, but not getting run out of the subway by angry citizens would probably be close enough for me. Even as a self-taught musician I don’t usually suffer from impostor syndrome but this was as close as I’ve come in a long time. I mean, where do I get the nerve? So I was pleased to witness no eye-rolling, no barely concealed pointing, and no other signs that people were thinking I had no business being there. Most people just walked by indifferent to me…like I was just another subway musician. Success! A few people reacted more favorably. Notably, I seemed to resonate with teenagers, several of whom were appreciative enough to drop a buck into my guitar case. And a guy with a video camera, who said he goes around New York filming interesting people, asked if he could film a couple of songs. So that’s out there now. In summer, the subway is often cool and comfortable, like when a train is going by, but otherwise is very still and hot. At 10PM, well past rush hour, there were enough still and hot times that I was quickly drenched (or maybe re-drenched) in sweat. And for a second show in one day, on top of all the driving lately, people seemed to appreciate the great effort I put out to entertain them. But it had been a long day. I was tired. The bad taste of the Portsmouth show was gone, and soon after, so was I. This entry was posted in Shows, Tour on August 17, 2015 by a one man band. Portsmouth was kind of a wildcard destination. I had no contacts there, no show planned, and knew little about the city. It took a long time to get there from deep in Maine, and we arrived around 9pm. The city was still kind of “up” and there were more than a few pedestrians wandering around, so it would have been feasible to play some music. But after a long day of driving, I was kind of not in the mood. Instead, my friends and I went out for a walk, stopped at a bookstore-themed bar for a beer, and checked into a hotel for a good night’s sleep. The next day, we drove back into the downtown area and breakfasted on coffee and bagels, while planning out the rest of our day. Then it was time to play some music. I got the gear out of the trunk of our car, and the search began. It was already hot and sunny–like everywhere else on this tour–so my main priority was shade, followed by things such as spacious sidewalks and pedestrian traffic. The trifecta seemed to be in front of a church near the very café we’d just been to. I’d like to say eventually a dam broke, and people became generally delighted by my foolhardy attempt to entertain. But I don’t think I ever penetrated the tough shell of New England Puritanism pervasive among these Pilgrim-descendants. I gradually felt tolerated, but never exactly “welcome,” by the people passing by. A few people did pause to take in a song or two, but most people maintained a sang-froid worthy of the most callous of big-city dwellers. Discomfited by such cold shoulders on such a hot day, I wrapped up and loaded the gear back into the car. Afterward we got ice cream at a friendly (!) shop by the waterfront, and idled in Portsmouth just long enough to get some sandwiches to eat on the trip back to the warm embrace of New York City. I don’t usually blog about shows at private residences, but although this one happened at a private residence, our hosts invited a bunch of neighbors over. In other words, I deem it public enough to talk about it. As I mentioned in the Black Fly Ball post, we arrived at the height of blueberry season, and I expected the sleeping bags of itinerant blueberry pickers to be strewn about the grounds of Cherryfield. But as I also mentioned, most blueberries are harvested by machine these days. Our hosts were initially drawn to Cherryfield in the days of manual picking, but have since stayed because this part of Maine is especially beautiful. Our hosts, Jill and Steve, had amazingly opened their home to us as mere friends of a friend, without so much as knowing what we looked like. We arrived well after midnight, and were still welcomed like old friends. The next morning, we were treated to an amazing breakfast featuring eggs from their crew of about 10 chickens, plus oatmeal, bacon, pancakes, anything you could think of for breakfast. And it was all delicious! Alas, they had been unable to attend the Black Fly Ball, but were curious about my one man band contraption. Fortified by one of the all-time best breakfasts, I offered to play a few songs, and they politely allowed it. Jill phoned some neighbors, and soon I had an audience of nearly ten–not even including chickens! They set up a wooden platform (a flat surface is good for managing heel-drum distances) and we propped a large cutout of Maine behind it. I then commenced to play. It was a little weird playing my songs of nihilism and alienation in this lush and loving environment, but I did it anyway. The audience “got” it in the best way: appreciating the sentiments without being freaked out by them. Like everywhere this week, it was quite warm in Maine. So I didn’t play too long, but was happy to play the song I’d written for the blueberry pickers one last time. After the show, we all made our way to a nearby creek for a cool-down before heading back on the road for Portsmouth, New Hampshire. On a personal note: Jill, Steve, if you happen to see this, thanks once again for being such generous and welcoming hosts. Our swing through Maine was a tour highlight, in no small part because of you. This entry was posted in Shows, Tour on August 16, 2015 by a one man band. The whole tour was kind of centered around this event. Our* first contacts in New England were some folks in Cherryfield, Maine, and they told us about the magical Black Fly Ball. In my mind, Cherryfield (Blueberry Capital of the World!) was awash with itinerant fruit pickers, who descended upon the town for the harvest season, which was…now. In reality, almost all the blueberries are picked by machines nowadays, and very few humans are required. Also, the Black Fly Ball was some 30 miles past Cherryfield in Machias, Maine. Having driven all the way from Montpelier, Vermont, and seeing our ETA get later and later, we were tempted to just pull over in Cherryfield and give the Black Fly Ball a miss. But I’m so glad we didn’t, because it was possibly the greatest show of the tour. Down east Maine on a Saturday night has seemingly stopped for the day. The dark highway is punctuated by closed filling stations and restaurants, and a few other cars driving way faster than us because it’s not THEIR first time here. But as we approached Machias, we suddenly observed a lot more human activity. The streets of this brightly lit small town were packed with cars, mostly parked, but some cruising. The event is positioned in a park just under a bridge, and we could see pedestrians swaying, under the influence of the music of one of the three bands playing, or perhaps some other substances. I didn’t want to barge right in and start playing, so we parked the car and did a little reconnoitering on foot. The three bands were strategically positioned to be individually audible, with only a few places where you could perhaps hear two at once–because maybe you like that sort of thing? I could only find one spot where I wouldn’t be competing with other musicians, right by the main entrance on the bridge over Bad Little Falls Park. I got the kit out of the car and proceeded to set up. And then I had the greatest fortune to begin playing just as one of the bands stopped playing, and many people were heading out of the park, right past me. This is about the best kind of audience: excited to hear music and slightly inebriated. Uncertain as always–wondering if these rural salt of the earth types will cotton to my big city ways of musicating–I began to play. Well I needn’t have worried. 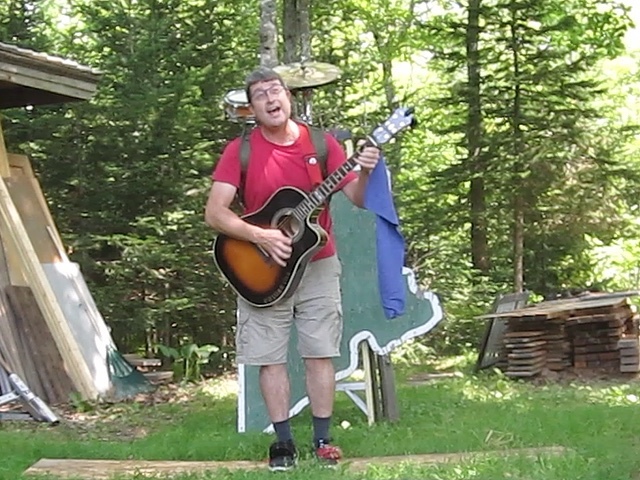 People immediately ceased their egress and eagerly watched me play song after song. I don’t think many stayed more than ten minutes of the 45 or so that I played, but there was a steady stream of replacements, and I had a consistently decent crowd the whole time. From the earliest days of planning a trip to the Blueberry Capital of the World(!) I had started writing a song for the blueberry pickers whom I had erroneously imagined descending on the region in this, the harvest season. I had so much looked forward to premiering it in blueberry country, but it was already clear there were no pickers to sing to. Nonetheless, I finally broke out the song, and got little reaction. I guess things change, and maybe I was stirring up more resentment than joy with it. So I continued past the song, and played a bunch more. A lot of people were taken with the spectacle of it. As is often the case, I could see surprise on people’s faces as they got nearer and realized it’s one person, not two or more, making this commotion. Many people dropped money in my guitar case, which I don’t usually dwell on, but is important on tour because gas isn’t free. As was the case for the entire tour, it was hot! A little after 10pm, I felt sufficiently sweaty, and played one last song. And then a very exuberant woman approached and pleaded for me to play just one more. She offered me $5 and a toothpick, so how could I refuse? From her wiry build and her age, I surmised that she must have picked blueberries at one point in her life. When I asked her, she got kind of a reverent look in her eyes, thinking of blueberries picked and never to be picked again. Yes indeed she’d picked blueberries. Okay, one last song, the one I had written especially for the blueberry pickers, “Blueberry Hell, Blueberry Heaven.” The beginning catalogs all the reasons you might be sick of blueberries, but the end has the realization that blueberries are wonderful, magical, and picking them puts you in one of the finest places on earth. My new friend was beyond ideal as an audience member: inebriated, amped on the very idea of music, and with a vested interest in the song itself. At the end, she joined me in wailing the repeated closing lines, and then whooped appreciatively. She gave me a big hug, and I packed it in for the night. My friends and I put the gear back in the car, and roamed around a little more. In the grange hall we came upon something we’d never seen before: a ukulele orchestra, a traditional ensemble at the Black Fly Ball. They breathed new life into a tired old song, “Drift Away,” and while it’s far from a favorite, at least I’ll have this memory to associate with it from now on. It seemed like the ball was far from winding down even as 11pm neared. We, however, were winding down after a long day of driving, with some rocking tossed in at the end. We headed to our hosts in Cherryfield, about which more later. This entry was posted in Shows, Tour on August 15, 2015 by a one man band. The show in Worcester felt like a great success, and it was with some confidence that we drove all the way up to Montpelier, Vermont. Even though, unlike in Worcester, there was no official show planned. I’d have to earn an audience from the pedestrians passing by…wherever I set up to play. We arrived about 5:30pm Friday, and there was decent pedestrian traffic on a beautiful summer evening. Montpelier has a pretty small downtown area for a state capital, so there wasn’t much looking around for a place to play. I walked by the many café and pub outdoor seating areas, but I prefer not to bother people who are seated without the option to leave. Then I remembered a friend suggested playing in front of the local record shop. It was just half a block off the main drag, so I’d be somewhat audible to pedestrians on said drag, and they could come closer if they wanted to hear better. I asked the proprietor if he’d mind my playing a few songs out front, and he offered no objection. It might be relevant that he seemed to be closing anyway, but it’s always nice to have permission. 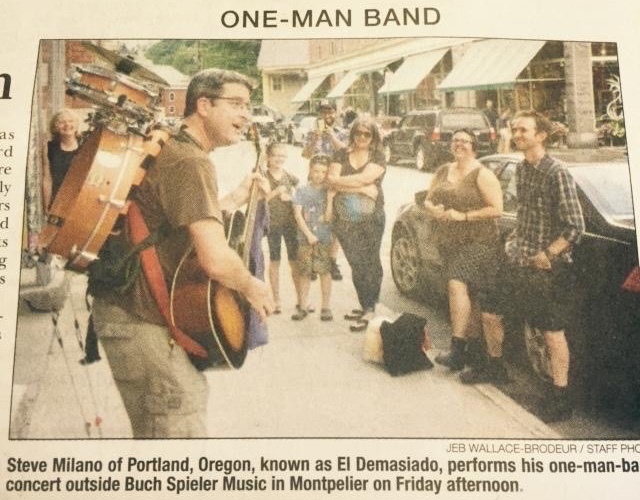 And so I set up in front of Buch Spieler Records in Montpelier, Vermont, and began to play. I’ve played music on streets in several different cities around the US. Sometimes I will get a real feeling that I’m filling a void, that the people nearby have been needing something more than what was there. (E.g., lots of times it’s near bus stops in bigger cities.) Sometimes there’s more hostility to what I’m doing, as if I’m intruding on something. I’d put Montpelier somewhere in the middle of that spectrum. I felt no outright hostility, but neither did I feel like rain falling onto the long OMB drought they’d suffered. Or to put it another way, some passers-by crossed the street to hear me more closely, others crossed the street to hear me more faintly; it was a nice mix. Well, at least the people in the picture seem like they’re having a good time. Although full disclosure would require my telling you, I personally know almost all of them. Even in this digital age, there must be something legitimizing about appearing in a printed newspaper. My mother actually texted me about how much she’d enjoyed reading about my exploits. And I didn’t even buy five copies for her! Like everywhere on this tour, it was HOT. I played as long as I could manage, then played some more. It’s hard to stop when a new listener walks up and wants to hear another song. But within the hour, I was spent, and packed up. After the show, we headed to the Three Penny Taproom to enjoy some of Vermont’s finest fermented beverages. Every tour has one wild night, and this was destined to be one. I sampled about everything on the beer menu (including the fabled Heady Topper) plus everything our host proudly offered from his refrigerator. And thus spent the latter part of the evening rather, uh, tipsy, and made about a hundred fruitless attempts to get a photo containing all three of our hosts’ pugs. After an amazing home-cooked breakfast the next day, we headed to Maine with me behind the wheel. One of my companions expressed amazement that it was able to drive after so much…reveling. I don’t know, maybe countless grueling hours of one-man-banding have hardened my constitution so I can better withstand an occasional evening of excess. Or more likely, it’s nothing more than tour adrenaline. We were heading to Cherryfield, Maine, to my first contact in New England, a friend of a friend, who told us about a music festival we could play at. It was kind of the keystone of the tour, and I couldn’t wait to get there! This entry was posted in Shows, Tour on August 14, 2015 by a one man band. There is a house on Forbes Street in Worcester, Mass., where the punks have loud shows in the basement. My own loud punk band has even played there with our pals Jacob the Terrible. So when I first began planning a tour of New England, it was only natural to try to play a show with those guys, even if my own band is a mere 1/4 the size of JTT. As the out of town act, I got mid-bill placement, and I wondered how my relatively quiet acoustical style would fit in with the electrified rocking. But it was fine. The audience for my set was quiet and attentive, in ways audiences usually aren’t with amplified music. It also seemed like people came down to the basement to see what this absence of noise was all about. And stayed. Then things really heated up, when Jacob the Terrible took the stage. They’re a really fun band, onstage and off, and the audience really got into it. And although my friend and I were utterly unsuccessful in finding beer before all the area stores stopped selling, the vast majority of the audience clearly had no similar trouble. I was almost moshed down! After the show, we headed to Providence, Rhode Island, where half of JTT lives, and they put us up in splendid fashion. We gabbed until quite late, then got a decent night’s sleep—for being on tour, anyway. The next morning, we breakfasted in a Providence café, where Jacob expounded on Bigfoot, ghosts, and the Berenstain Bears theory. Bellies and heads full, we headed to Montpelier, Vermont. This entry was posted in Shows, Tour on August 13, 2015 by a one man band. The first scheduled show of the tour was set for the house on Forbes Street in Worcester, Massachusetts. Because we (my roadie and I) were traveling from Brooklyn, and wanted to avoid Connecticut’s seemingly perpetual traffic going north, we headed north pretty early. We beat the traffic, but arrived in Worcester well ahead of showtime. We tooled around the city a bit, and had some terrible pizza for dinner, and started looking for a place to meet up with the Terribles. They weren’t in Worcester yet, but recommended stopping in at Hotel Vernon where a mutual friend is a bartender. There were a few people there, as day-drinking turned into night-drinking, and we settled in for a pint ourselves. It turned out the bartender would not be able to attend the show, and asked if I wanted to play a few songs in the bar. I’m always up for interesting new places to play, so why not? Some of the folks were curious about the setup process, others looked on with a kind of dread. When I finally began to play, the curious were entertained, the dreaders did not even turn around on their stools. I played just a few songs–got to save something for the show–and handed out a bunch of calling cards and stickers, then packed it all up. I think I made an impression, because not long after I got home, one Dominic from the show used the form on this site to ask me to come back. That’s kind of a first, so you know what, Dominic? I just might!